Falcons wide receiver Mohamed Sanu and defensive end Dwight Freeney have both made huge contributions for their team this year and their former employers in years past. However, there was a time where they both could have been making contributions for the Patriots, as they admitted they were tempted to come play in New England. Sanu had talked to the Patriots last offseason, and Freeney almost signed as a free agent in 2012. "It was pretty tempting," Sanu said. "It was definitely thought about, and talked about, but at the end of the day, I did what was best for me and what I thought was the best fit." The Patriots seemed to have made out alright, though. They signed Chris Hogan to a three-year deal shortly after Sanu signed with Atlanta. "I was behind enemy doors!" the personable Freeney said with a laugh. "But, really, that was a great experience. Those are great guys, man. I have so much respect for what they do over there, and a lot of friends on the staff. And, of course, Bill [Belichick], who I’ve known from Pro Bowls and all those games." 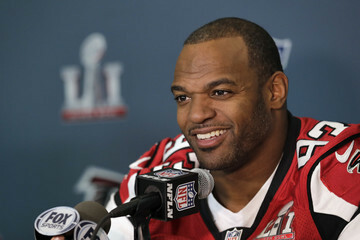 Freeney and the Patriots are very familiar with each other. Once thought of as one of the best pass rushers in the NFL, Freeney was at the center of many Colts-Patriots games during his time in Indianapolis. Brady even referred to Freeney at one time as the most intimidating defensive player in the NFL. And he's got every reason to hate Brady and the Patriots, but he says he can't bring himself to do it. Is it me, or does it feel like some people are starting to come around on the whole hating Brady thing?